In the golf community, much like other luxury sports, individuals want to dress to impress and dress to be noticed. With that, picking out your clubs and outfit and even your this can be an all-day adventure. With that in mind, we want to make the press much easier by sharing with our audience the top ten best golf knickers that you can buy today. Now, do you know what a golf knicker is? 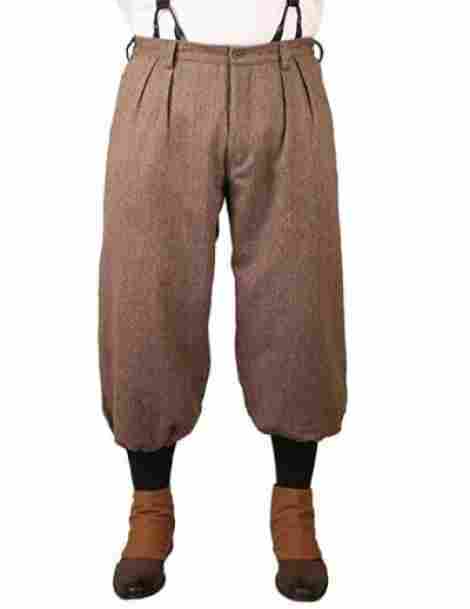 A golf knicker is considered one of the oldest past times in the history of golf. A knicker used to be known as a luxury outfit that was worn by the elite in the golf community. Everyone from Walter Hagen to Bobby Jones wore golf knickers and they sure made head turns. In fact, until today they are considered a past time outfit. 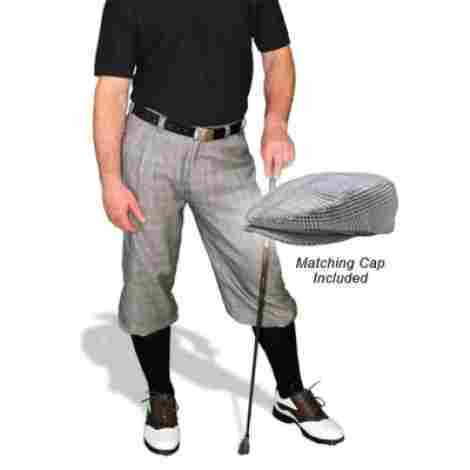 It is considered one of the outfits from the “golfer age” where the photos used to be black and white and everyone wanted a Ford. Well, today we are eager to share the top ten best knickers in the industry. How does it look? Well, a golf knicker is designed to be loose and comfortable and at the knee, there is an elastic band where it tightens at the knee. The purpose of this is so an individual wears it with very bright and colorful socks that go up to the knee. Match it with a quality blazer, a long sleeve shirt, a fedora, and you have yourself one of the classiest outfits in all of golf history. Well, sadly it is now known as a vintage and retro outfit that has been replaced with more modern comforts such as dress shorts and polo shirts. However, you can bring back the style! Tell us which one is your favorite out of the ones below. Let’s begin! 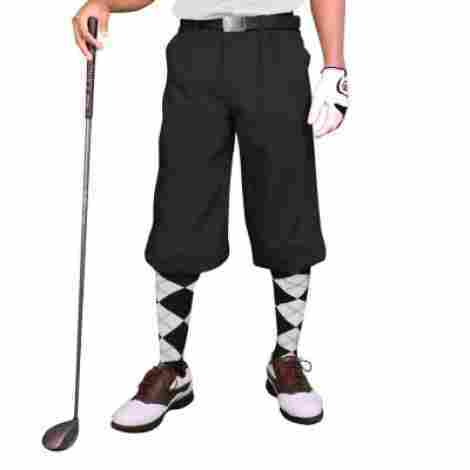 When you are seeking to impress on the golf course, there is no better outfit than a quality golf knicker. If you are seeking on impressing and standing out, you may want to try the Golf Knickers Wool Par 5. With a comfortable design and different durable qualities to consider, here are a couple of features as to why this is a great outfit. A golf knicker happens to be one of the most traditional golf outfits in the industry. Designed for the golf course, it is made for individuals that want a quality and traditional product. Part of this traditional design is the wool material. This product is made of 85% acrylic and 15% wool, which creates one of the most comfortable products to consider. To continue with the topic of comfort, this product comes with an elastic band and a comfort-ease design to ensure it is easy to put on. With an inner lining at the knee for enhanced comfort, the material ensures longevity and durability. The elastic waistband design may be one of the best design properties of this item. As far as cost and value, first, this product happens to be a classic and elegant golf design. To add to this, this brand is widely known for creating and evolving some of the highest quality designs in the industry. Overall, what makes this product so pricey is that it comes with a matching cap, ball marker, and a tee pocket as well. Quality golf knicker made of wool and acrylic. Inner lining for added comfort. If you are a fan of plaid, then this is the product for you. With that, it resembles one of the most luxurious brands in the industry. We want to discuss the Kings Cross Ultimate Knickers Outfit and the unique style that is this modern and comfortable plaid outfit. With socks to match, and even a cap included, here are two design features of this product. What is most amazing about this outfit is that it happens to be a full out golf outfit. This product includes the knickers, the sweater, the cap, and even the socks. All you need is some quality golf shoes and an undershirt. The vest happens to be made of a plaid design that resembles Burberry with a golf cap to match. Another quality of this product that is excellent is the fact that the outfit is made of silk. The silk design is due to the stylish and comfortable knickers bottoms that are very high quality and durable. The silk is also lightweight and very luxurious. If you are seeking a full out fir for the golf course, look no further. The price for this product is well priced because it includes a full set. You get the cap, socks, and many other bonuses with this product. To add to this, it looks and feels a lot more luxurious than the price would suggest. 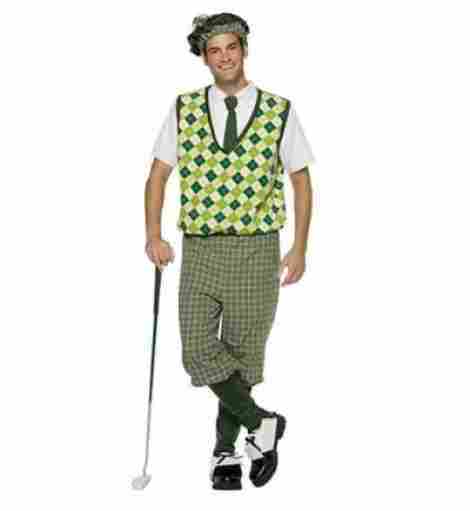 If you want to look like a winner on the course and wear a traditional outfit, this may be the best choice for you. Quality design that includes it all. May fit kind of large and bulky. Inspired by gentlemen’s fashion of the 19th and early 20th centuries, this product is for individuals that want to look like a classic gentleman. This is a high-quality product that is durable, well design and simple. If you are seeking comfort and durability, the Historical Emporium Wool Blend Tweed Knickers are worth considering. The material design of this product is both luxurious and durable. The material is a blend of wool, acrylic, and polyester. To add to this, this product happens to be satin lined in the knees to ensure maximum comfort to the individual wearing it. Although it is durable, it should only be dry cleaned only since the primary material is acrylic and wool is very fragile. If you are a fan of wearing suspenders, then this is a great outfit for you. This product comes with suspender buttons and a belt loop. To add to this, the design is intended to be comfortable and the suspender buttons are easy to adjust and attach to suspenders for a trusted durable fit. As far as the price, this product is worth considering if you are a fan of quality knickers. Overall, the design is high quality, simple, and durable. With that, the construction is made to last and as long as you dry clean only, you can wear this product for years to come. It does only come in this color, but the brand offers them in different sizes. Made of wool and acrylic. If you want to look royally awesome, then you may want to consider the next product on our list. This is the Royal and Awesome Golf Knickers and it is quality designed to be durable and it resembles a fashionable design that is common in the golf community. With plenty of colors to choose from, this is the first brand that offers color and variety in their products. Here is the first feature! The material design of this product is very different than the ones we have shared. The material happens to be a blend of cotton and spandex. With that, the brand has 97% cotton and 3% spandex. With this, an individual can expect the overall product to be comfortable and stretchy, allowing for all-day comfort qualities. Also, it is machine washable, making it very easy to clean. The fact that this product comes with spandex as a material ensures maximum comfort. With that, the design is comfortable and the elastic in the knee makes ensures that it has the traditional knicker design without losing comfort. The spandex is also at the waistband to ensure it is easy to put on and wear. Lastly, it comes with pockets so you can have your cell phone or wallet with you. The price of this product resembles many other knickers in the industry. The price is common among brands that create this kind of style. What is the best about going with this brand is the fact that you get a quality product that comes in seven different colors to choose from. Whether you buy one or collect them all, they are all worth it. Quality cotton and spandex material. Elastic band design for durability. Trusted brand with plenty of followers. The leg length is a bit long. We have come to the middle of our list and it is time to share and discuss a product that is durable, comfortable, and built to last. The Black Golf Knickers Par 3 is a quality product that is made with plenty of comfortable features. However, what is worth notating the most is the material design. We want to discuss the material and the comforts of this clothing item. This product is actually made from a very unique and different material in the industry. This item is made from a very lightweight microfiber material. To add to the qualities of this product, microfiber is also very lightweight and high quality. Overall, the design is guaranteed to last and be very durable. You can also machine wash microfiber and the design is intended to withstand the test of time. The comfort of this product is in the fact that it comes with an elastic waistband that makes it very easy for you to put on the knickers without discomfort. With that, the design is simple, high quality, and durable. However, the comfort-ease design is part of the overall value of this product. As far as cost, this product is around the same price range as many others that we have shared. However, it is made of very different material quality, which if you love microfiber, you will love this product. To add to this, the design is simple, high quality, and the overall elastic comforts add to the general value of this product. More so, you can select your favorite design over twenty different color choices. Elastic band and pleated front pockets. Product is larger than expected. 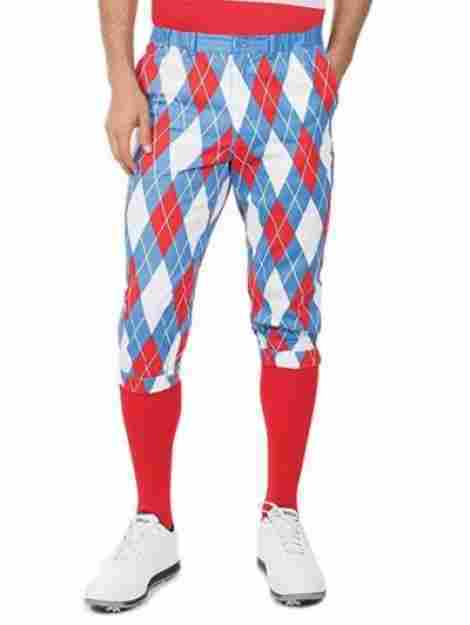 If you are feeling a bit patriotic, then you may want to consider this next golf knicker. Designed like the American flag with red white and blue, we want to share the Tipsy Elves American Flag Knickers and a couple of excellent features from this product. It is modern, quality designed and made to be comfortable. Now, we have not yet talked about a feature such as this one. One excellent design of this product is the golf socks. The golf socks of this product have a non-slip strip that is designed to ensure maximum grip. With that, you never have to worry about the sock riding down or becoming uncomfortable due to the design and the quality. The design of this product is very comfortable. Knickers, in general, are made to be looser. However, this product comes with an adjustable waistband that makes it easy for an individual to adjust to their ideal length and comfort level. However, it also comes with an elastic lining at the knee for enhanced comfort and durability. The price for this item is actually much less than other knickers in the industry, making it a worthwhile item to consider. With that, the traditional design is very retro and comfortable. Overall, the design is of high quality and can even be machine washed due to the material durability. However, read the washing instructions to ensure the product will not fade. It does have 4.5 stars and this brand is widely known for their quality products. Comfortable design and easy to wear. Non-slip strip in the socks. Trusted brand with great shipping and customer service. This is the third product from this brand on our list, and it is because they have produced some of the largest selection of products in the industry. We want to discuss, as product number seven, the Start-In-Style Khaki design from this brand. Made with comfortable qualities and durable design, this product is worth considering. The socks from this brand are diamond patterned and designed to be durable and comfortable. The design is a 75% cotton and 22% nylon sock that also includes spandex for stretch and comfort. To add to this, the sock is designed to not ride down when they are worn for long periods at a time. The khaki and black design also match with many shoes and shirts. The material of this product is made of 1005 microfiber. 1005 microfiber is designed to be durable and very soft. The only thing is to make sure you clean and wash them correctly to ensure the microfiber does not get damaged. With that, the golf cap and socks are included with the purchase. As we said above, you not only get the knicker pants, you get the socks and a quality cap included. With this, individuals are getting a great value deal for the price. Overall, the design is high quality, effective, durable, and constructed to be very traditional. With that said, we can recommend this to individuals that want a traditional and khaki color design that demands to be seen. Comes with ball and tee pocket. Has specific washing instructions which make it difficult. As the eight products on our list that we want to discuss the Chainhub Industrial Old Fashion Knickers. This product is simple, high quality, easy to wear, and very comfortable. If you are an individual that wants a simple and easy to wear product with a very comfortable design, this is it. Here is the first of two great features of this design. This design is intended to have a very comfortable feel around the waist and around the inseam. With that, the design has a very high-quality elastic waist, so an individual can easily adjust it and be comfortable all day long. To add to this, the design is very durable, and the material construction is intended to fit comfortably and feel soft. The fit of this product is loose and baggy to resemble the old fashion styles that were really common. With that, the fit does have an elastic knee seam and waistband for easy adjustment and so they fit very comfortably. 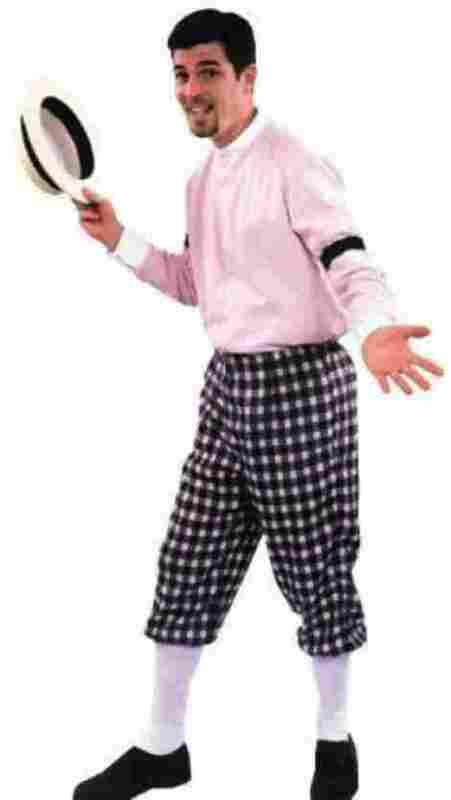 Simply add some white socks and very comfortable golf shoes and you get a quality outfit that stands out. As far as the cost and the value, individuals that may want a very simple knicker design that is high quality and easy to wear will love this product. The product itself is durable and designed to last. With that, it is priced very well and designed to be easy care. More so, the price allows individuals to buy multiple if they so desire from this brand compared to brands that are pricey. Does not come with other bonuses like other brands. We have come towards the end of our list and we are excited to share a fun-looking knicker golfer outfit that comes with the hat and everything. If you like a green and yellow diamond shape vest and design, this is the product for you. 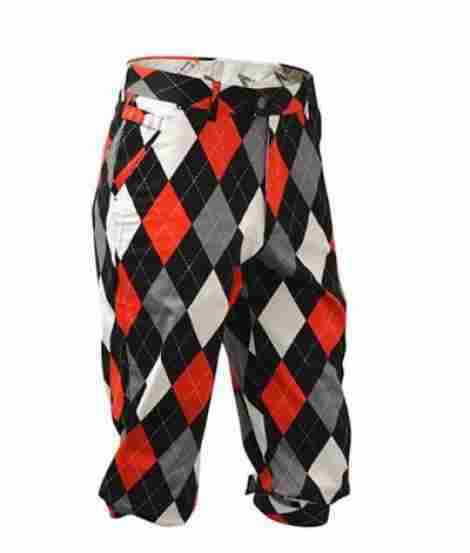 From the Rasta Imposta brand, this is the Old Tyme Golfer outfit and it is quality designed to be durable and simple. If you are looking for a quality set that includes everything you need, this may be it. When a brand includes a set, what is the best quality about it is that every part goes together seamlessly, and they are all made of the same construction value and quality. This brand includes a sweater shirt with a quality tie, knicker pants, and the sock covers. With that, you have a full out for that is ready for the golf course. The material of this product includes polyester and spandex. For instance, the elastic waistband is designed for comfort and quality and guarantees that the user will be able to easily put these pants on and wear them all day. It also comes with the loops for a belt and the whole product is very well stitched. As far as the price and the benefits, this product is a full set for a relatively low price. In fact, the whole set is what normally a pair of quality knickers cost. With that, the product is not the best material composition, but it is designed to be comfortable and easy to wear. This brand also has a reputation for creating quality products and durable value. Comes as a full set with tie and socks. May snag or may have loose threads. 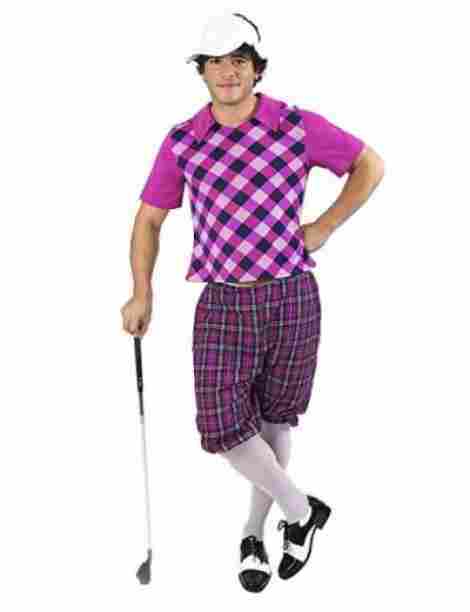 Time to discuss the last costume on our list, this is the Orion Costumes Men’s Tartan Pub Golf Stag Costume and it is a fun and fancy quality knicker outfit for the golf course. If you want to dress like the professionals and feel like the professionals, this is the costume to get. The overall design of this product is durable, comfortable, and very stylish. This product includes many different pieces for the overall set. The set includes a short-sleeve top that is comfortable and durable. It also comes with purple knicker shorts and a white visor with adjustable features. The design does exclude the long white socks and the golf club and shoes. However, the primary components are there. The design of this great product is intended to be very durable and machine washable. With that, the elastic waistband design is comfortable, and it ensures a secure fit overall. To add to this, the design is intended to have a form-fitting comfort, while also ensuring durability and enhanced security in the areas of stitching that are most important. When considering cost and value, this product is a very playful and modern take on the knickers that we have shared. They are designed with a purple tint and overall modern flair, such as the purple polo instead of the long sleeve shirt and the knickers do not have a belt loop or a suspender strap. With that, they are well designed and come in various sizes. If you want a modern take on this vintage fashion design, this is worth considering. Quality design that is intended to last. Comfortable shorts with elastic waistband design. Provides a secure and comfortable fit. Not available for fast shipping. Now that you have gotten to know the top ten best knickers, we want to hear from you. Have you ever worn one or would you ever wear one? It will turn heads at the course! With that, there are a few companies that still focus solely on this specific design, such as Golf Knickers and King Crossings. These brands and companies all create some of the best and most luxurious outfits in the industry. Classic outfits with a flair. So, if you are considered a knicker, these were our recommendations. Now, if you are looking to conduct your own research and find your own, we want to discuss and share with our audience the criteria for evaluating the best brands and the best designs. If you do not know much about this specific outfit, we invite you to read our criteria for more familiar information. Our intention is to break down what is important when considering the best knicker. The material composition is definitely one of the most important elements to consider when selecting such a product. The reason being is that the material composition is what gives the product it’s value, alongside the construction and the durability. Therefore, we want to dive in and look at three of the most common materials that this particular product is made out of. As the first material, cotton and polyester are both among the most commonly used in creating products such as this. With that, cotton and polyester are two separate materials but we wanted to put them together due to the same quality and reasons why it is cotton. They both are extremely durable, and most importantly, they are very easy to wash, unlike a couple of other materials which we will discuss in a bit. With that, polyester and cotton are also very common in creating different benefits such as comfort, softness, and overall quality. This material may be one of the most famous and common in the sportswear industry. In creating knickers it is intended for the purpose of comfort and quality. For instance, different areas of the product will have elastic such as the waist and knee area. With that, the material composition may even be a small percent elastic, which allows for the product to be more comfortable, breathable, and easy to put on. Some different outfit sets that include a shirt may even have elastic in it. Now, this is the one material we really want to discuss with our audience. Acrylic material happens to be a less quality and inexpensive material fiber to produce. Many brands create it to resemble the texture and softness of cotton and durability of polyester. It has more of a wool-like feeling than anything else. With that in mind, individuals can expect acrylic to have specific washing instructions, which is what makes it more of a hassle. Many acrylic products tend to be dry-cleaned only. With that in mind, individuals may want to consider the material of the knicker. Let’s move forward and discuss another important criterion to consider. Now, this criteria is a very important element to consider because many brands have different sets of knickers or products to consider. First, you may want to consider that you can buy a knicker by itself or you can by it with a full set that includes other important items. 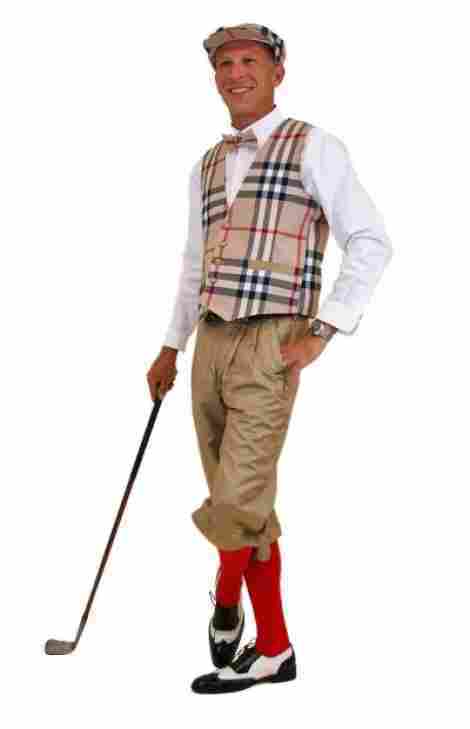 A full knicker outfit consists of the pants, a long sleeve shirt, a vest or blazer, bow tie, fedora hat, long socks, and of course, quality golf shoes or golf loafers. With that, many brands do have full sets to consider, and it all depends on what you are looking for. Also, you can buy a single knicker by itself, which will cost less. Many individuals will buy a set and then buy separate knickers to match with the set. Buying independent items may prove to be costlier. Which leads us to an important bullet point to consider this criteria. The cost of a knicker can range depending on the brand quality and the material. Of course, cotton, which is a highly valued material is designed to be more costly. With that said, other factors that determine the cost is if the set comes with other extra bonuses such as a fedora or socks. The package quality of the product is another element to consider. Not only do the pants need to be made to last and designed for quality, but the overall design of the product. When selecting the best ten products our concern was to look into the overall package quality. This means diving into the many different important aspects of what was included alongside the style. Which leads us to another important element, matching your outfit. A knicker is not only a pant design, but it is also the whole outfit. With that, we wanted to ensure that each package was designed to match from bowtie to pants to long sleeve and more. Overall, we also wanted to guarantee that each package had a quality material design. To add to this, individuals can expect that many brands have many sizes available. With that said, let’s move forward and answer some of the most frequently asked questions that interested individuals want to know. Q: Are the knickers machine washable? A: As one of the most asked and also most important questions as far as golf knickers, we want to answer this in two parts. First, some knickers are machine washable but it depends on the material of the product. For instance, many golf knickers are made out of an acrylic material blend. This material blend can only be dry cleaned and not machine washed. Therefore, it is important to consider what kind of material blend your products are made out of because washing them the wrong way can ruin the material. Secondly, many brands do have a return policy in the case that you wish to return the product because it does not fit or you do not like the way it feels. Q: Do the knickers have belt loops? A: Of course! All knickers come with belt loops and an elastic waistband design that ensures an individual will be comfortable and most importantly, be able to wear a belt. Now, what is most unique is the fact that many knickers come with suspender loops as well. Back then suspenders were worn as part of the style with this specific product. Therefore, many brands still stay true to that style today. Q: Are they designed to fit baggy? A: Yes, this specific product is designed to be baggy. The reason being is that it was the style back then. Therefore, do not expect any knicker pants to come as slim fit or snug designs. They are all baggy. However, you can modernize the style by wearing a slim fit shirt if you wish. Q: What goes into the proper knicker outfit? 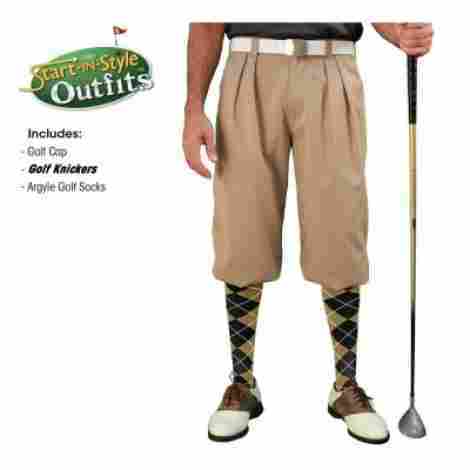 A: If you are seeking a proper knicker outfit, you want to wear quality pants, long socks, and golf shoes. To add to this, many individuals wear a long sleeve shirt with suspenders or a vest and a blazer as well. Q: What is the best size to choose? A: You want to choose your knicker pants based on your waist and inseam. With that, keep in mind it will always fit baggy, but the waist should fit just right.